Twelve Voices from Greece and Rome is a book for all readers who want to know more about the literature that underpins Western civilization. Chistopher Pelling and Maria Wyke provide a vibrant and distinctive introduction to twelve of the greatest authors from ancient Greece and Rome, writers whose voices still resonate strongly across the centuries: Homer, Sappho, Herodotus, Euripides, Thucydides, Plato, Caesar, Cicero, Virgil, Horace, Juvenal and Tacitus. To what vital ideas do these authors give voice? And why are we so often drawn to what they say even in modern times? 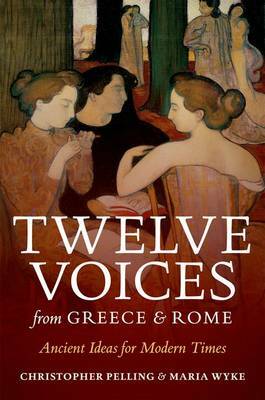 Twelve Voices investigates these tantalizing questions, showing how these great figures from classical antiquity still address some of our most fundamental concerns in the world today (of war and courage, dictatorship and democracy, empire, immigration, city life, art, madness, irrationality, and religious commitment), and express some of our most personal sentiments (about family and friendship, desire and separation, grief and happiness). These twelve classical voices can sound both compellingly familiar and startlingly alien to the twenty-first century reader. Yet they remain suggestive and inspiring, despite being rooted in their own times and places, and have profoundly affected the lives of those prepared to listen to them right up to the present day.